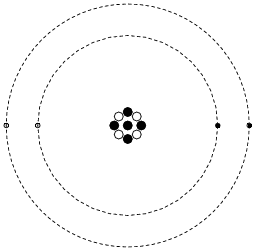 Shown here is a simplified representation of an atom: the smallest division of matter that may be isolated through physical or chemical methods. Inside of each atom are several smaller bits of matter called particles. Identify the three different types of ëlementary" particles inside an atom, their electrical properties, and their respective locations within the atom. Neutrons reside in the center ("nucleus") of the atom, as do protons. Neutrons are electrically neutral (no charge), while protons have a positive electrical charge. Electrons, which reside outside the nucleus, have negative electrical charges. Most, if not all, students will be familiar with the ßolar system" model of an atom, from primary and secondary science education. In reality, though, this model of atomic structure is not that accurate. As far as anyone knows, the actual physical layout of an atom is much, much weirder than this! A question that might come up in discussion is the definition of "charge." I'm not sure if it is possible to fundamentally define what "charge" is. Of course, we may discuss "positive" and "negative" charges in operational terms: that like charges repel and opposite charges attract. However, this does not really tell us what charge actually is. This philosophical quandary is common in science: to be able to describe what something is in terms of its behavior but not its identity or nature. Hint: look up each of these elements on a periodic table. Each atom of carbon is guaranteed to contain 6 protons. Unless the atom is electrically charged, it will contain 6 electrons as well to balance the charge of the protons. Most carbon atoms contain 6 neutrons, but some may contain more or less than 6. Each atom of hydrogen is guaranteed to contain 1 proton. Unless the atom is electrically charged, it will contain 1 electron as well to balance the charge of the one proton. Most hydrogen atoms contain no neutrons, but some contain either one or two neutrons. Each atom of helium is guaranteed to contain 2 protons. Unless the atom is electrically charged, it will contain 2 electrons as well to balance the charge of the protons. Most helium atoms contain 2 neutrons, but some may contain more or less than 2. Each atom of aluminum is guaranteed to contain 13 protons. Unless the atom is electrically charged, it will contain 13 electrons as well to balance the charge of the protons. Most aluminum atoms contain 14 neutrons, but some may contain more or less than 14. While you're researching the numbers of particles inside each of these atom types, you may come across these terms: atomic number and atomic mass (sometimes called atomic weight). Be prepared to discuss what these two terms mean. Be sure to ask your students what definitions they found for ätomic number" and ätomic mass". It is highly recommended that students seek out periodic tables to help them with their research on this question. The ordering of elements on a periodic table may provoke a few additional questions such as, "Why are the different elements arranged like this?" This may build to a very interesting discussion on basic chemistry, so be prepared to engage in such an interaction on these subjects if necessary. The chemical identity of the atoms (whether it is an atom of nitrogen, iron, silver, or some other element). The mass of the atom. The electrical charge of the atom. Whether or not it is radioactive (spontaneous disintegration of the nucleus). The chemical identity of the atoms: protons. 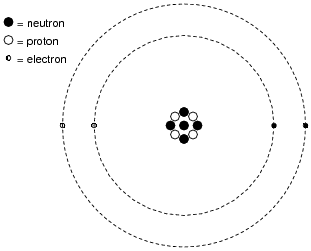 The mass of the atom: neutrons and protons, and to a much lesser extent, electrons. The electrical charge of the atom: electrons and protons (whether or not the numbers are equal). Whether or not it is radioactive: neutrons, although one might also say protons in some cases, as there are no known ßtable" (non-radioactive) isotopes of certain elements, the identity of an element being determined strictly by the number of protons. It never ceases to fascinate me how many of the basic properties of elements is determined by a simple integer count of particles within each atom's nucleus. In the answer, I introduce the word isotope. Let students research what this term means. Don't simply tell them! The Greek word for amber (fossilized resin) is elektron. Explain how this came to be the word describing a certain type of subatomic particle (electron). When a piece of amber is rubbed with a cloth, a static electric charge develops on both objects. Early experimenters postulated the existence of an invisible fluid that was transferred between the amber and the cloth. Later, it was discovered that tiny sub-atomic particles constituted this "fluid," and the name electron was given to them. This question provides a good opportunity to discuss the history of electricity, and how its understanding and mastery has dramatically changed peoples' lives. Be sure to ask questions about Benjamin Franklin and the modeling of electricity as a fluid. Scientific discovery is often assisted by models, but may also be hindered by them as well. Franklin's model of electricity as a fluid has done both (conventional versus electron flow notation)! It is much easier to electrically "charge" an atom than it is to alter its chemical identity (say, from lead into gold). What does this fact indicate about the relative mobility of the elementary particles within an atom? Electrons are much easier to remove from or add to an atom than protons are. The reason for this is also the solution to the paradox of why protons bind together tightly in the nucleus of an atom despite their identical electrical charges. Discuss with your students the importance of this fact: that electrons may be added to or taken from an atom rather easily, but that protons (and neutrons for that matter) are very tightly "bound" within an atom. What might atoms behave like if their protons were not so tightly bound as they are? We know what happens to the electrons of some atoms when substances are rubbed together. What might happen to those substances if protons were not as tightly bound together as they are? Early scientific researchers hypothesized that electricity was an invisible fluid that could move through certain substances. Those substances "porous" to this "fluid" were called conductors, while substances impervious to this "fluid" were called insulators. We now know what electricity is composed of: tiny bits of matter, smaller than atoms. What name do we give these tiny bits of matter? How do these particles of matter relate to whole atoms? In terms of these tiny particles, what is the difference between the atoms of conductive substances versus the atoms of insulating substances? Although electrons are present in all atoms, and therefore in all normal substances, the outer electrons in conductive substances are freer to leave the parent atoms than the electrons of insulating substances. Such "free" electrons wander throughout the bulk of the substance randomly. If directed by a force to drift in a consistent direction, this motion of free electrons becomes what we call electricity. It is worthy to note to your students that metallic substances - the best naturally-occurring conductors - are characterized by extremely mobile electrons. In fact, solid-state physicists often refer to the free electrons in metals as a "gas" or a ßea," ironically paying homage to the "fluid" hypothesis of those early experimenters. The specific details of why some atoms have freer electrons than others are extremely complex. Suffice it to say, a knowledge of quantum physics is necessary to really grasp this basic phenomenon we call ëlectricity." The subject becomes even more complex when we turn to superconductivity and semiconducting substances. What would happen if you placed two electrons near each other in free space? Would they repel each other or attract each other? How about two protons? How about an electron and a proton? How about a neutron and a proton? I'll let you research which charge type (positive or negative) is characteristic of electrons, protons, and neutrons! As for their respective physical reactions, particles of differing charge are physically attracted to each other while particles of identical charge repel each other. Many students will want to know "why?" in response to electrical charges. The technical answer has to do with electric fields extending through space, but this may be a philosophically impossible question to answer. The concept of charge was invented to explain the physical behavior of electrical attraction and repulsion, but coining a term to explain a phenomenon does nothing to explain why that phenomenon occurs. Still, this is a worthwhile subject for discussion, especially if students have done their research well and know something about the history of electricity. Atoms are very, very small pieces of matter. This fact should go without saying, but it behooves us to be reminded of just how small atoms are. Chemists and physicists use a unit of measurement to represent quantities of different materials based on how many atoms (or molecules) there are in a particular sample. This unit of measurement is called the mole. 1 mole of pure iron metal weighs about 56 grams. Based on the definition of a mole, how many atoms of iron are in this 56 gram sample? There are approximately 6.022 ×1023 atoms in this 56 gram sample of iron. What does this quantity look like when written in non-scientific notation? The purpose of this question is twofold: to reinforce the fact that atoms are really, really tiny, and to introduce students to the use of scientific notation. How many atoms of iron are there in a sample measuring 2 ×103 moles? Determine the answer without using a calculator! There are 1.2044 ×1027 atoms of iron in this sample. Many students first learning about atomic structure and electricity notice a paradox with respect to the location of all the protons in an atom: despite their electrical charge, they are tightly bound together in a "core" called the nucleus. Based on what you know about electrical charges, explain why this is a paradox, and also what the solution to the paradox is. Paradox: since similar charges tend to physically repel each other, why should protons (all positively charged) cling so tightly together in the nucleus of an atom? Why don't they fly apart from each other due to electrical repulsion? I'll let you research the answer to this paradox yourself! Believe it or not, I once read a religious tract that used this paradox as proof of God's existence. The argument went like this: everyone knows that like charges repel, so it must be God who holds the protons together! Volumes could be written on the psychology behind this argument, but I digress . . . The solution to this paradox is the subject of freshman-level college physics. For those of you who don't know the answer, I'll give you a hint: it has something to do with the power of nuclear fission. Admittedly, this is not a challenging problem in algebra, but it is important to introduce practical algebra to students in a gentle way at first. You may be surprised how many students have a theoretical knowledge of mathematics only, and find it difficult to apply even simple algebraic principles to realistic situations.